According to the jobs report released this morning by the Bureau of Labor Statistics, the labor market added 236,000 jobs in February, marking three years of job growth since the low point following the Great Recession in February 2010. The strong showing in February is very welcome, but it is useful to put it in context. We have a jobs deficit of 8.9 million jobs (the 3 million we are still down from when the recession started, plus the 5.9 million we should have added over this period to keep up with growth in the potential labor force). Even at February’s growth rate, we wouldn’t get back to the prerecession unemployment rate until mid-2017. The jobs deficit is so large that to return to the prerecession unemployment rate by February 2016, another three years from now, we would have to add 320,000 jobs every single month between now and then. The unemployment rate dropped to 7.7 percent last month, its lowest level in the aftermath of the Great Recession. This drop, however, was not due to a larger share of the working-age population landing jobs, as labor force participation slipped back to its lowest point of the downturn. The job gains of the last three years have been entirely in the private sector. The public sector continues to shed jobs, losing 10,000 in February. Since the recovery began in June 2009, the public sector has lost 742,000 jobs (with nearly half of that, 355,000, in local public education, which is basically public K–12 education). These losses continue to be an enormous drain on the recovery. The share of unemployed workers who have been jobless for more than six months increased to 40.2 percent in February, reversing much of the improvement of the last four months. 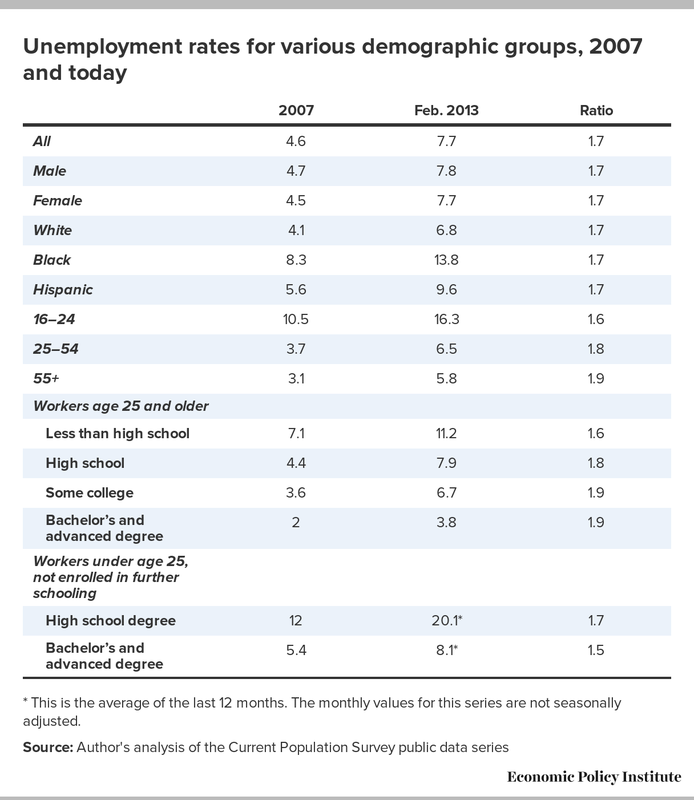 The long-term unemployed share remains close to its all-time peak of 45.3 percent in March 2011, and is still far above its prerecession share of 17.4 percent in December 2007. The fact that we still have large numbers of long-term unemployed is unsurprising given that the ratio of unemployed workers to job openings has been 3-to-1 or greater since September 2008. The length of the average workweek ticked up in February to 34.5 hours, still slightly below the December 2007 level of 34.6. Average hourly wages increased by four cents in February, and 2.1 percent over the last year. This remains far below the prerecession growth rate, as persistent high unemployment has exerted strong downward pressure on wage growth. With the increase in hours, average weekly wages grew somewhat more strongly, by $3.76 in February. Average weekly wages have grown 1.8 percent over the last year. Construction added 48,000 jobs in February, a good sign. Some of this growth could be due to warmer weather in February, but the uptick in housing means that we should expect growth in construction. Manufacturing increased by only 14,000 jobs, higher than its average monthly growth rate of 10,700 of the prior three months, but still too slow. In major subsectors within the broad service sector, the jobs numbers looked similar to what we’ve been seeing. Retail trade added 23,700 jobs, slightly lower than its 34,900 average gain of the prior three months. Health care added 32,000, slightly higher than its average gain of the prior three months of 25,000. Temporary help services gained 16,000, good news after gaining 11,900 on average for the prior three months. Restaurants and bars added 18,800, down slightly from its 24,800 average gain of the prior three months. For additional evidence demonstrating that the reason unemployment remains so high is a broad-based lack of demand for workers, not that today’s job seekers aren’t suitable for the jobs that are available, see EPI’s Economic Snapshots from Jan. 16, Jan. 23, and Jan. 31 (the last two show unemployment by industry and occupation, respectively).